By Nicholas Arthur, sport climber and friend of the Notch. LAST WEEK I did the White Mountains Bicycle Tour with my close friend Henry. It’s a three-day, 130-mile cycling tour that includes overnight stops at three hostels: Notch, Rattle River, and White Mountains Hostel (see their joint blog post for more info on these havens). We each carried a change of clothes, minimal food (a few bars, nuts, sausage), and water (2L each). Since this tour involves a reasonable amount of elevation gain, every pound counts. Neither Henry nor I are very experienced cyclists. I have some experience bike touring, but Henry had never ridden further than about 20 miles and was on a glorified mountain bike, proving any fit person can do this tour. A less fit person with a better bike and/or gear shuttling should also find it challenging yet achievable. I recorded our ride on Strava, you can see our ride by following the links in each day’s title. We started at the Notch, opting to carry our own gear rather than pay for the shuttle service. After passing through the shops and restaurants of downtown North Woodstock (breakfast recommendations here! ), the route enters the woods at the Franconia bike path. Eventually, the path ends, the road begins, and the speed picks up. The shoulder here makes for comfortable riding. We opted to take a gravel path as a shortcut to getting on to Rt 2, but at this point we were quite tired and a bit conflicted on whether this was worth it [Notch note: based on Nick’s feedback, we do not recommend this shortcut]. Nice to be off the main road, but bumpy. Towards the end of the day, there is one more hill to climb. Not any harder than the climbs at the beginning, but this smooth grades feels unrelenting at the end. When we arrived in Gorham we got a pizza and fries at Mountain Fire Pizza, which ran us about $20 each but was very filling. We drank an inadvisable quantity of mountain dew here due to unlimited refills. Once at Rattle River Hostel, we showered and our dirty clothes were washed for us (this is very helpful, as it means you only need one change of clothes). This hostel along the Appalachian Trail was quite social and we had a great time hanging out and chatting with the thru hikers. In the morning there’s pancakes, coffee, and ibuprofen. This is the easiest day of the tour by a decent margin. If I were worried about it being too easy, I’d recommend combining this day either with Bear Notch (go here, scroll to Day 2, MAKE IT LONGER), or with a hike at Pinkham Notch. 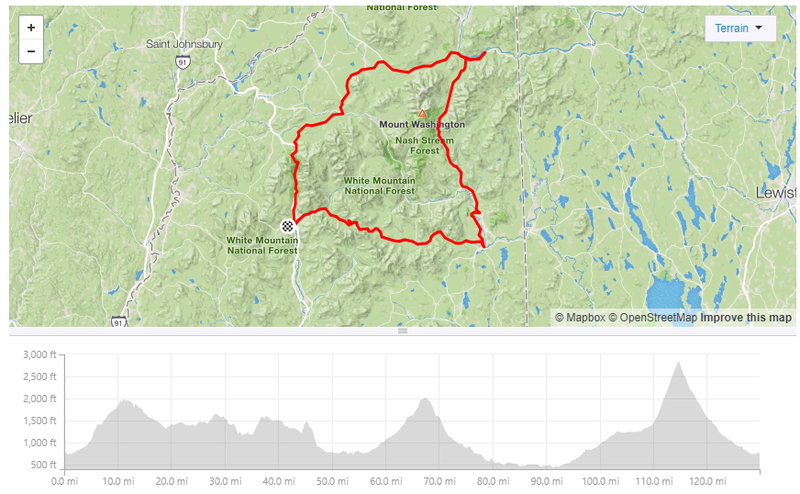 The crux of this ride is climbing 1.8k’ to Pinkham Notch. We ate our lunch here, and continued on. Going downhill was awesome, I went about 40mp/h on the descent and could have easily gone faster had I trusted my bike more. Smooth road, comfortable turns, and a sizable shoulder make a for an enjoyable descent. After the descent the road flattens out and it’s a mostly flat ride to Conway. I’d recommend stopping in North Conway to buy groceries if necessary. The grocery store closer to the hostel is suboptimal. There’s a Mexican restaurant and a nice looking cafe in town, but we decided to be frugal. At White Mountains there’s a cool record collection, a TV with Netflix/Amazon, a guitar, and board games to pass the time. Additionally the kitchen can accommodate multiple groups cooking simultaneously. It’s possible to start immediately on to Kancamagus highway, however we opted to take Passaconnaway Road, which was well worth it. It’s off the main road, paved, and includes a covered bridge. At 18 miles or so, the earth turns up. Luckily there are a number of turnoffs and overlooks to take breaks on during this climb. We were quite proud of having only stopped twice. There were some raspberries here. It’s worth a stop, for a lot of reasons. This road, in addition to being the most difficult, is also the most dangerous of the tour. There’s a number of right turns with minimal (~1-2′) shoulder and a guard rail. Despite this, the road is quite popular among cyclists, which should mean that cars are generally aware of the possibility of cyclists just-around-the-bend. It’s all worth it to reach this sign. Afterwards, cruise down the hill, and don’t miss the bike path next to the Loon Mountain Resort. Henry is too tired to look at the camera. Coming back into town there are a number of places to eat. Black Mountain Burger is quite good, for example. Compared to other bike tours I’ve done this offers better views , easier navigation and higher road quality and makes for a more athletically interesting route as a result of the climbs. There’s a definite satisfaction to reaching the top of the hills at Pinkham Notch and Kancamagus Pass. Opting to go without gear shuttling was great, especially since we could easily bring snacks with us and save money on eating out/shuttling/etc. While some official bike tours are pricey or have rigid schedules, we appreciated that this tour could easily be done on a budget and we could adjust the route and schedule to our fit our goals for the trip. Hanging out at the hostels and talking to some of the thru hikers definitely made me more interested in the AT. We enjoyed a sort of mutual admiration of the difficulties of thru hiking vs. bike touring whilst hanging out at the fire, in addition to a really bizarre set of topics ranging from inane to philosophical. It was a worthy tour. Ready to ride? Visit whitemountainsbicycletour.com and sign up for your fall tour today.